To my surprise and delight, this month's Daring Bakers Challenge was dedicated to the dietary restricted bakers, those of us who muddle through the challenges vegan, gluten free, or with food allergies. 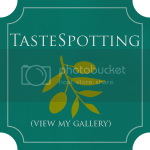 To make the challenge even better, it was hosted by two of my very favorite bloggers, Natalie of Gluten A Go Go and Shelly of Musings from the Fishbowl. 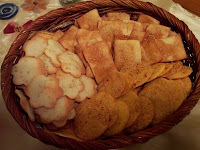 They chose a recipe for Lavash Crackers from Peter Reinhart's The Bread Bakers Apprentice, asked us to make a dip, gave us gluten free options, required that everything be vegan, and otherwise set us completely free to choose flavors and toppings. I may have gotten a little carried away, so I'll refer you to the original recipe for instructions on how to make the crackers, and just list the ingredients I used for each of the four versions I made. The crackers did not take the full 15-20 minutes to bake, and all of these were done in 12-16 minutes. These are all half batches, which is what I generally make when I'm experimenting, so I'll definitely double the quantity when I'm making them again, except for the water/baking soda mixture for the first cracker. The Kid will also probably request that I use dinosaur cookie cutters, instead of these shapes! There's a commercial pretzel cracker on the market that I really enjoy, but my son is unable to eat due to his food allergies. So the first cracker I made was a Pretzel Cracker. The only variation in technique for this cracker (the rectangular one), was that I used a pastry brush to spread the water and baking soda mixture onto the crackers instead of misting them with water. 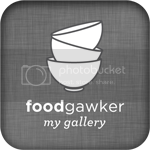 This was the flakiest cracker with the closest to a commercial taste and texture. The next cracker I attempted was a Corn Cracker (the round one). It would made an excellent healthy substitute for a deep fried corn chip. I'm always amazed by what the gluten free Daring Bakers are able to accomplish without wheat. Rice crackers are some of my favorite, so I decided to be daring and try making Sesame Rice Crackers (the flower shaped ones). I had a little trouble with the rise, and they are somewhat hard, but the taste makes them worth trying again. 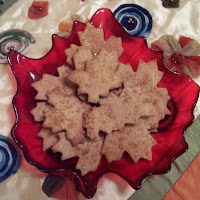 Next, I decided to make a sweet version, a Maple Wheat Cracker. This was probably the least attractive, but best tasting of all four variations. 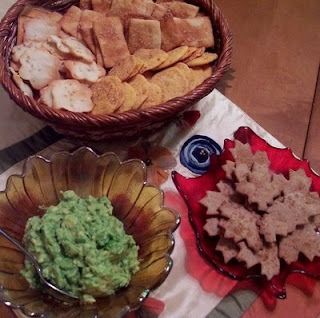 Finally, I made an avocado dip to accompany the savory crackers. It wasn't a hard choice. Just so you understand how I feel about avocado, if forced to, I'm not sure I could choose between it and chocolate. This dip is simple, but unlike a spicy guacamole, the taste of the creamy fruit shines through. 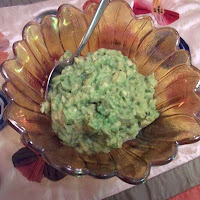 Peel and quarter the avocados and place in a medium bowl. Add the other ingredients and mash together with a potato masher. Serve immediately. I loved how thrifty and practical these crackers were, while still giving me so much room to experiment and be creative. Many, many thanks to both Shelly and Natalie for such a wonderful challenge! Four different variations! I've got to try the maple ones, Alex loves maple. I've had to ban the commercial pretzel chips from the house because I'm so addicted to the honey mustard flavor. So I think I'll avoid making the pretzel ones. I don't have the self control to not eat the whole batch in one sitting! Maybe I can make them when there are guests over to save me from myself. Holy cow, talk about amazing! Completely overachieving!! Congrats on the RAST testing! We've gotten the "those levels are so dang high, its not even worth checking this year" talk for the past 2 years! So maybe next year I keep telling myself! Four versions! You go!!! Nicely done!